“The least likely person is the killer, and no one is really who they seem.” So Jordan Hope tells his cast as they prepare to rehearse Agatha Christie’s The Mousetrap. However, Jordan does not realize that, nearby, in the snowy streets of Gastown, a real murder has taken place. By the time the show is over, another will die and The Agatha Principle will strike again. In her fourth book featuring the Beary family, Elizabeth Elwood delivers another thoroughly satisfying collection. 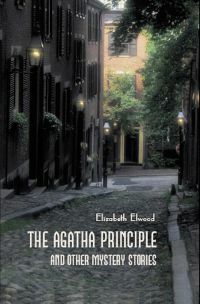 “The Agatha Principle” is followed by seven cleverly crafted shorter stories with a variety of settings. With intriguing puzzles to challenge the reader and an engaging story of a charming heroine whose relationship with a Vancouver detective is as captivating as the cases they solve together, The Agatha Principle and Other Mystery Stories is a must for lovers of classic mystery fiction.